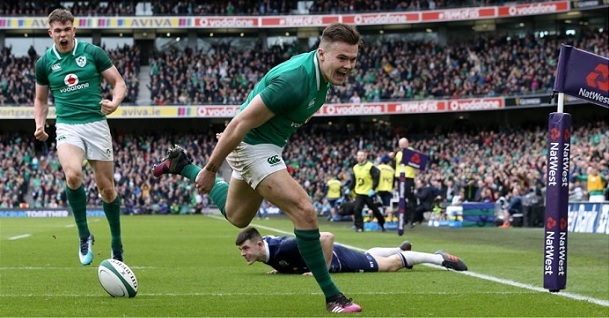 Scotland will host Ireland at Murrayfield in the second round of the 2019 Six Nations. Scotland started off with a 33-20 home win over Italy. It wasn`t the greatest game for Scotland, but they did win it easily, actually much more clearly than the score reflects (it was 33-3 at one points). It was definitely a victory Scotland needed after they didn`t look that great in the last International window. Back in November, Scotland had a big win over Fiji, but lost against Wales and South Africa, and struggled to beat Argentina. Ireland entered the tournament as the big favorite after winning the Grand Slam last year, and having an overall brilliant 2018 which included even a win against New Zealand. However, the Irish suffered a huge disappointment last weekend, losing 20-32 at home against rivals England. Ireland was without a doubt the second best team in that game and always looked like they were going to lose it. They will need to get back their groove if they are to bounce back today at Murrayfield. Bet on Scotland vs. Ireland and claim your 100% (120 Euro) freebet at LSbet now! Scotland will be without Nel and Skinner, but will welcome back Maitland and Gray, so they will break even in terms of injuries. Ireland has lost Stander, Toner and Ringrose, all important players, but the Irish have the depth required to replace them – and the changes could have a good effect after last week`s beatdown. Scotland is looking pretty good based on what we saw against Italy, and they are always dangerous at home, but Ireland will be an enormous test, and the Scots might fall short of passing it – just like they did in 5 of the last 6 meetings. Ireland remains one of the Top 2 teams in the World despite last week`s defeat to England, and you would back them to bounce back here. No matter how you spin it, it`s hard to see Ireland losing two matches in a row considering how strong this team is. Both lineups are looking good, but Ireland will have a crucial advantage in the forwards department, and their scrum should be able to dominate and milk penalties. Ireland’s problems against England came mostly from this department, but Scotland will not be able to out muscle them like England did. Ireland`s bench is also looking better and could make the difference in the last 30 minutes if needed. No precipitations are expected come game time, but it will be very windy in Edinburgh. Still, it`s hard to predict if that will be an advantage for one team or the other – it shouldn`t be. The Irish are a wounded lion at the moment and that is a very, very scary opponent for anyone to face. A good game of rugby is expected, but in the end Ireland should have too much, so I am backing them to win this match. It`s difficult to believe they will lose 2 games in a row and blowing their chances at the title after just two rounds. Prediction: Scotland – Ireland 21 – 26.